The preview for Gary Ham’s “Sentimentrees” and Ragnar’s “Engine” will be out tonight, but here is a collection of what we have seen so far. More Designer Con news!!! Shing Yin Khor (Sawdust Bear) will have Single Horned Grave Beast one-offs available for $200 at the Circus Posterus booth #400. 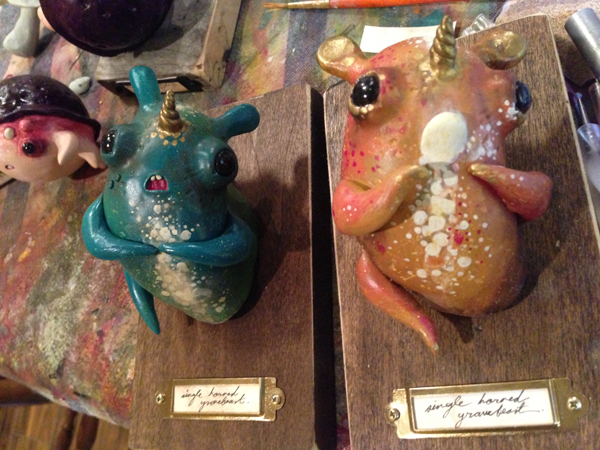 Mounted on wood, these uni-horned bugs are all expression filled and ready for the Pasadena Convention Center. Have those tentacles been grabbing powdered doughnuts? 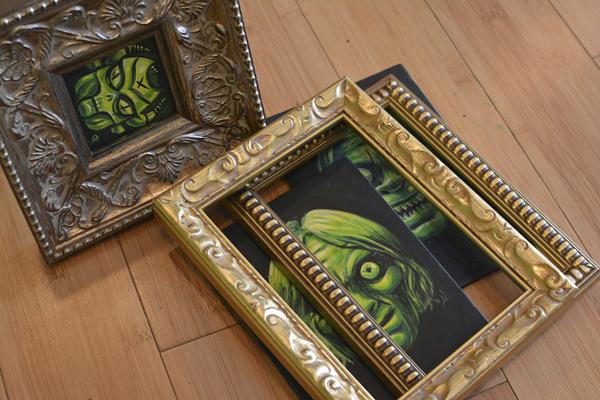 This is a prime opportunity to pick up original art like these beasties by Shing and have a fun conversation. Shing is a delight to talk to and her vast knowledge of comics, art, bugs, and weird things knows no boundary. 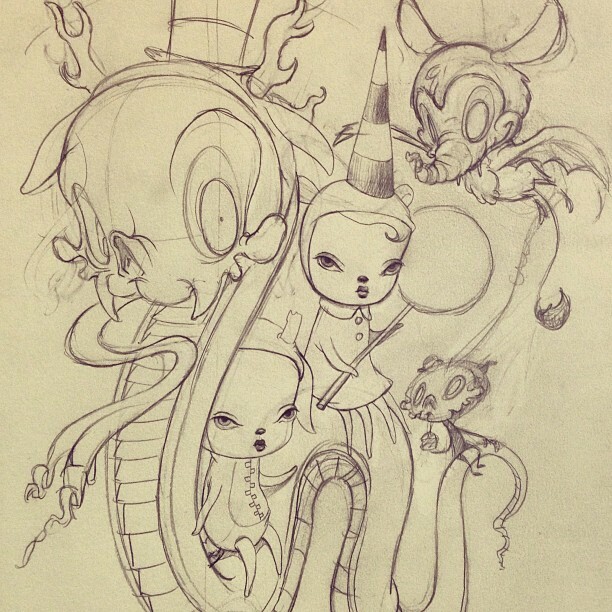 Travis Louie’s “Strange Discoveries” at the Merry Karnowsky Gallery on Saturday, November 9th. If you are attending Designer Con, why not come down and see the amazing surreal paintings by our very own Travis Louie. I’ve always thought of the Victorian era as an age of discovery. As there was almost a second “Industrial Revolution” sometime between 1840 and 1870, many new things were invented and discovered. While all manner of steam driven machines, boats, trains, etc, . . . were allowing for great transitions in industry, I am still fascinated most by early photography. Often to mark the existence of new species and the recording of important events, 19th century photography became the great equalizer. Photographs were new enough that people thought of them as verifiable proof even though they could be altered by crude means during the developing process. I think of “spirit photography” and the wonderful hoax put on by Elsie Wright and Frances Griffiths in 1917 where they claimed to have taken actual photographs of fairies. I painted these images to look like old photographic portraits, as a sort of “proof” that the accompanying stories may or may not have happened. These paintings are mostly about people making strange discoveries; a primate is found in South America that can act and is brought back to perform on the West End stage, a man finds an incredibly large bug attached to his house, a woman is convinced that an unusual helmet can protect her from harmful thoughts, an entomologist makes a startling discovery when he finds strange moth in his house, . . .
An odd thing for me about this show is that I believe these paintings are tighter than any I’ve done before and I always get anxious thinking that maybe I’m the only one that notices this. 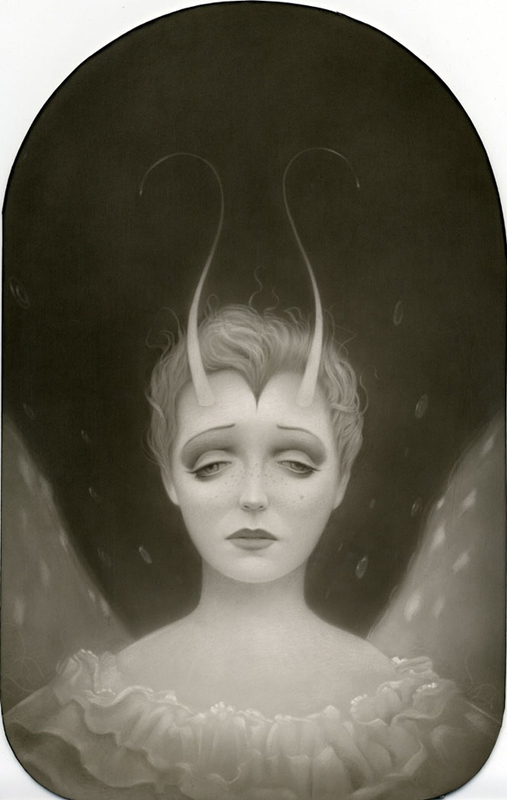 The paintings are mostly transparent layers of acrylic paint applied to smooth grounds over a light, but very finished graphite drawing. These paintings are dedicated to my father who passed away in April. He was a dreamer who never got to fulfill his dreams. He made it possible for me to work on mine and for that I am eternally thankful. The preview for Ragnar’s “Engine” and Gary Ham’s “Sentimentrees” goes out tomorrow, but we thought it would be fun to squeeze in a few more glimpses into the show (and their studios). 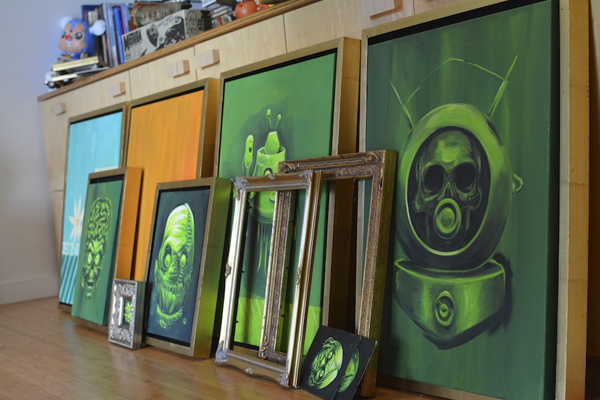 Another angle in Ragnar’s studio with an entire arsenal of work ready to go to Albuquerque. We finally get a better view of the alien spaceman I was wanting to see, and it is everything I imagined! The almost night vision greens give this alien (or is it human?) a great vibe. 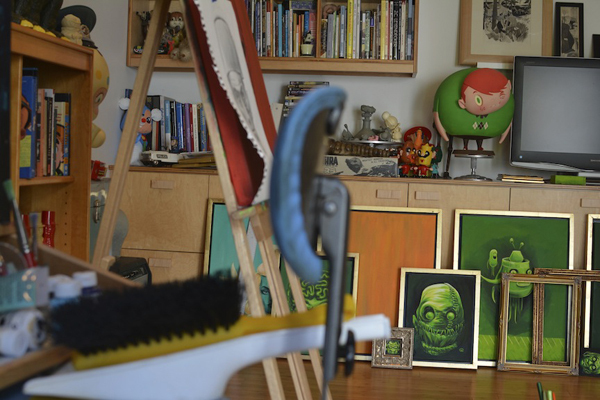 And another view that shows some of the fun in Ragnar’s studio. Yes, you are seeing double! Scott Howard and his alter ego Teen Wolf! 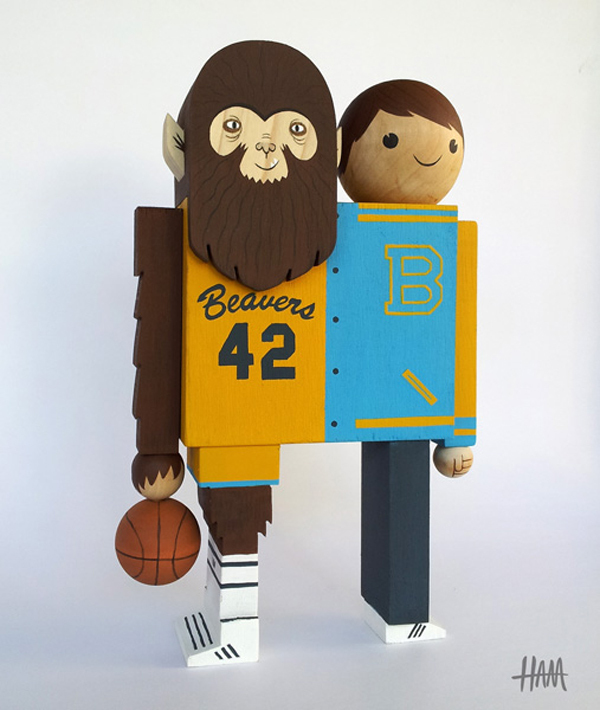 Gary’s amazing wood piece is a nice nostalgic throwback to that classic 1985 film. Oddly enough, I watched it this week and it holds up. Be it riding on top of a van as the wolf or hanging in a dark closet with Boof, this wolf will howl this coming Friday at the opening. Ragnar’s “Engine” opens alongside Gary Ham’s “Sentimentrees” on November 1st at Stranger Factory with an opening reception from 6-9pm. Do you have your must-have list started for Designer Con yet? 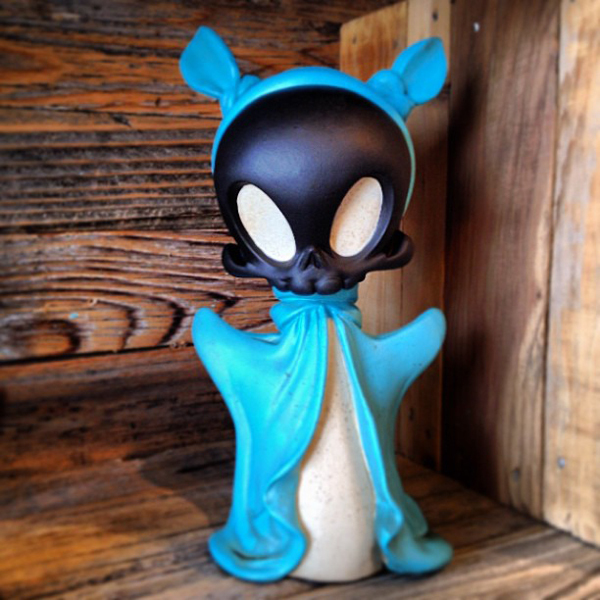 It may be just Tuesday, but we are bringing you the Blue Monday Boo micro run for DCON. Since it is a “micro” run of only 8, you better bet your britches these won’t last long. The color choices on this Boo are some of the best to date! Don’t worry about lining up early on Saturday or Sunday at the con because we will start handing out random tickets with line numbers starting when the doors open. 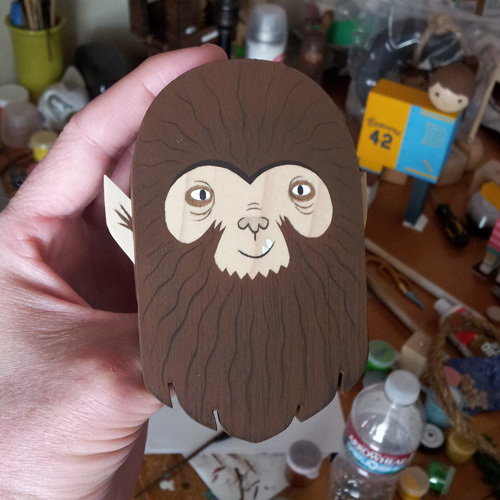 For the first couple hours of DesignerCon, Circus Posterus sales will be handled lottery style. Get ready for another fun-filled trip down memory lane, because we have another preview from Gary Ham’s “Sentimentrees“. Crank up the nostalgia meter to 11 because this one we all probably know very well. 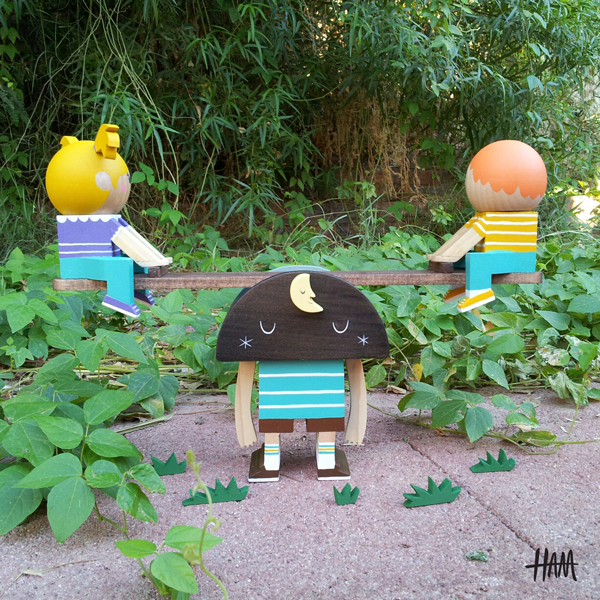 Some call it a seesaw and some call it a teeter totter, but for most of us, it was a staple of our childhood. Fond memories of pushing up into the air faster and faster …and then your cohort jumps off and you crash down hurting your bum. 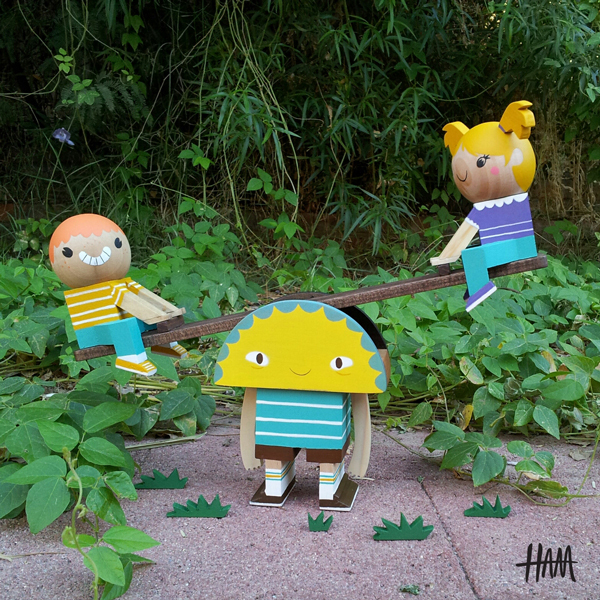 Well, Gary has captured all the fun of the seesaw, with his little wooden kids and the huge smiles on their faces and not a care in the world! The anthropomorphic totter is a bright smiling ray of sunshine, and on the reverse is a pleasantly exhausted night. Being a new father, we suspect that Gary is drawing on a lot of real life for this show. Did you notice the wood cut blades of grass? Gary’s attention to detail is stunning, as usual, and we can’t wait to see these perfect little playsets set up for the show! 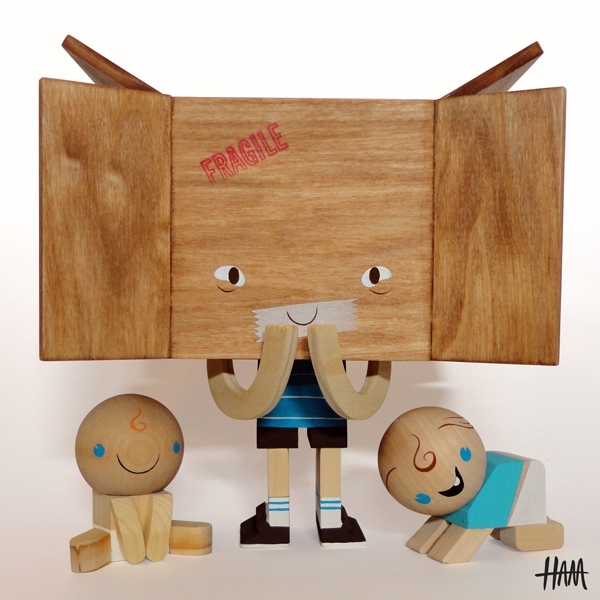 “Sentimentrees” by Gary Ham is based around the personification of his own sentimental childhood memories. If the things we loved as a child could walk and talk, what would their childhood be like? As children, we saw our treehouse as a trusted friend and sanctuary; as adults we see a wood box nailed into tree branches. “Sentimentrees” brings us back to seeing our playthings through the optimism and unconditional love of our youth. 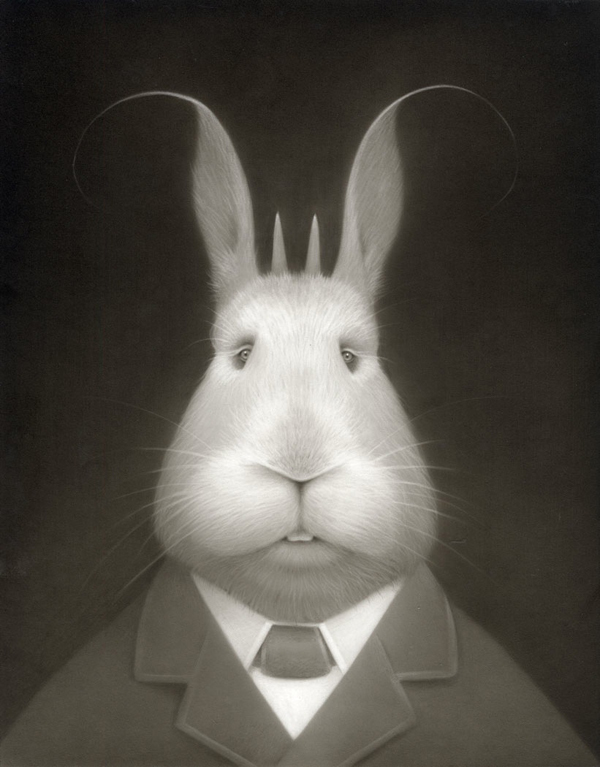 November 1st – December 1st, with an opening reception on Friday, November 1st from 6 – 9 PM. If you were paying attention when this little sketch popped up on Brandt’s Instagram feed last week, you probably saw this coming! Brandt and Kathie have illustrated one of the three limited edition posters for DesignerCon. Featuring some of our favourite characters, this print will be available at the super low price of $15, or in a set of three for $40. All of our artists are super busy these days getting ready for Designer Con 2013! We’re getting a steady stream of little tidbits, and rush to get it out to you as soon as we can. We did get an update from DrilOne this weekend, and he says he is in the lab mixing up all kinds of greatness for the con. 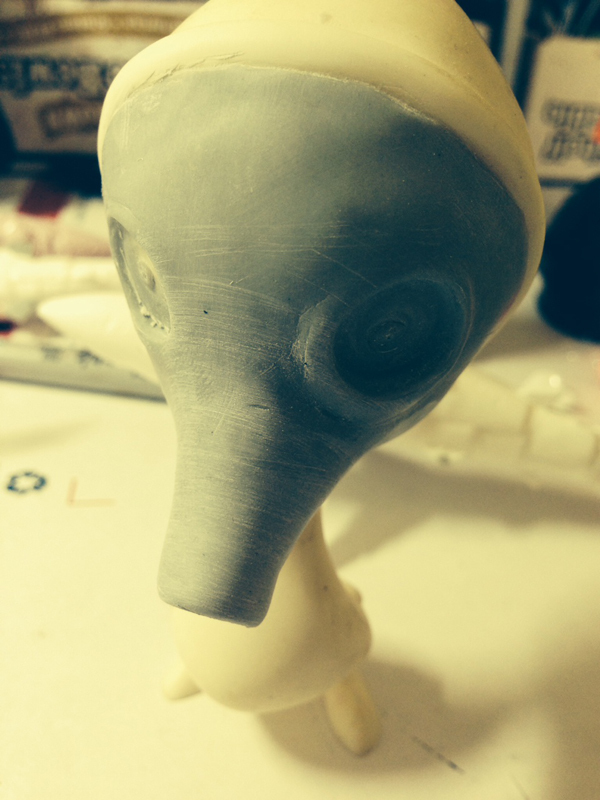 It looks like he is working on a Skelve of sorts with a treademarlk gas mask! 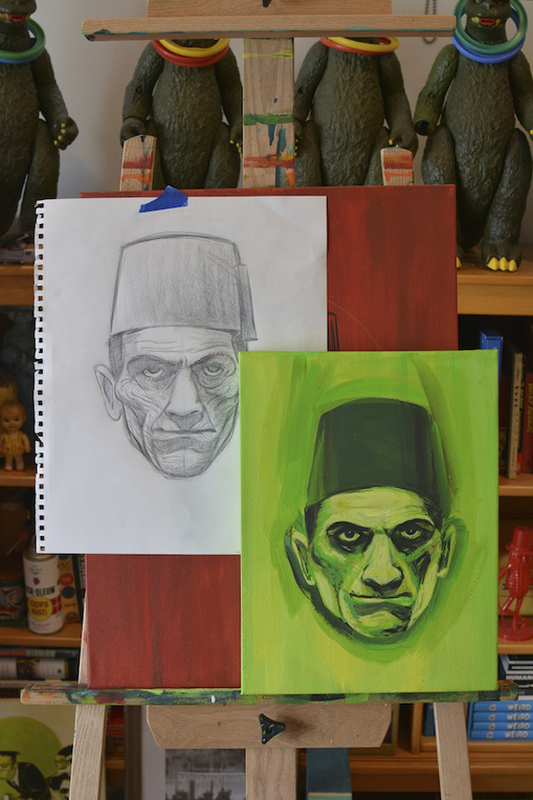 This is only a work in progress image, but the clues are there, and looking positively fabulous. We know that this toy is shaping up to be a classic Dril piece, so get ready. More details soon! We told you about the release of the new Terror Boys Gohst Bat [skelsuit] by Ferg and Brandt Peters here, but now we have even more images of this Halloween drop! He’s looking real good! The release date is set for Halloween day! It will be available in the Project Squadt store on Thursday, OCTOBER 31, 12:00 noon – central time. Happy Monday…well, now it is! We got another preview image from the almighty Ragnar for ya’. It looks like Brandon is trying to pick out the proper frames for a few of the pieces for “Engine“. This will be a very creature heavy show from him, and we couldn’t be more pleased. His love of early cartoons really shows in these ghouls. 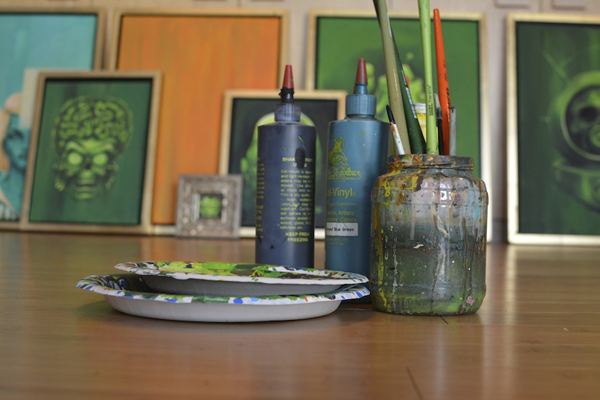 We thought it would be fun to throw in some of Ragnar’s paints too, but if you look to the right you will see a little preview of another piece from the show.